Review posted November 30, 2018. I so love Sophie of Sophie’s Squash! Sophie is a girl who adopted a squash as her best friend, Bernice. At the end of the first book, Sophie was delighted by the “birth” of Bernice’s children, Bonnie and Baxter. The start of this book doesn’t explain all that. 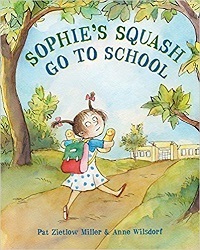 It shows Sophie walking into a classroom, hugging her two squash, with happy faces drawn on them. It’s not clear if the classroom is preschool or Kindergarten, though I suspect preschool. Sophie’s parents tell her she’s going to have lots of fun and make lots of friends. And no one appreciated her two best friends, Bonnie and Baxter. “Are those toys?” asked Liam. “Do they bounce?” asked Roshmi. “Can we EAT them?” asked Noreen. As the book goes on, Sophie resists making human friends. They just don’t get it. But one boy named Steven is persistently interested and kind. I like the way in the illustrations, Bonnie and Baxter slowly begin becoming spotty. Still, Sophie knew Bonnie and Baxter wouldn’t last forever. She starts thinking about doing things with actual people. At the end of the book, after Bonnie and Baxter have been bedded down in the earth for the winter, an idea from Steven prompts Sophie to help show the whole class how to grow plant-friends. But before too long, tiny shoots appeared. Sophie and Steven did a new-plant dance and invited everyone to join in. This book doesn’t have the “instant classic” feel of the first. But Sophie still has the same firm (not to say stubborn) personality, deciding for herself who her friends will be. And it feels true to the character that she would grow up to be this way. In fact, she still reminds me of my young niece – who doesn’t necessarily make friends easily and believes she knows how things should be, but is ever so lovable because of (not in spite of) her quirks.